Mohamed Sahraoui was born in Biskra, Algeria on May 26th, 1978. He received the Engineer and Magister diploma and the PhD degree in electrical engineering from the University of Biskra, in 2001, 2004 and 2010 respectively. 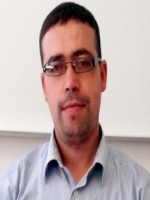 Mr. Sahraoui is an assistant professor with the University of Biskra since 2005 and he is a member in the LGEB Laboratory. His research interests are related to condition monitoring and fault diagnosis in power electronics systems and AC machines. Doctor, Condition monitoring, University of Biskra, Biskra, Algeria, 2010. Amaral, A. M. R.; Sahraoui, M.: ''Capacitors''; Diagnosis and Fault Tolerance of Electrical Machines, Power Electronics and Drives, A. J. M. Cardoso (Editor), , 195-286 pp., IET - The Institution of Engineering and Technology (978-1-78561-531-3), London, UK, 2018. Hammoudi, M. Y.; Saadi, R.; Cardoso, A. J. M.; Benbouzid, M. E. H.; Sahraoui, M.: ''Practical Implementation of H-Infinity Control for Fuel Cell-Interleaved Boost Converter''; International Journal of Modelling and Simulation, Vol. , No. , pp. 1-18, November, 2018. Laadjal, K.; Sahraoui, M.; Cardoso, A. J. M.; Amaral, A. M. R.: ''Online Estimation of Aluminum Electrolytic-Capacitors Parameters Using a Modified Prony's Method''; IEEE Transactions on Industry Applications, Vol. 54, No. 5, pp. 4764-4774, September / October, 2018. Benchabane, F.; Guettaf, A.; Yahia, K.; Sahraoui, M.: ''Experimental Investigation on Induction Motors Inter-Turns Short-Circuit and Broken Rotor Bars Faults Diagnosis through the Discrete Wavelet Transform''; 3D Printing and Additive Manufacturing, Vol. 135, No. 2, pp. 187-194, April, 2018. Yahia, K.; Sahraoui, M.; Cardoso, A. J. M.; Ghoggal, A.: ''The Use of a Modified Prony's Method to Detect the Airgap-Eccentricity Occurrence in Induction Motors''; IEEE Transactions on Industry Applications, Vol. 52, No. 5, pp. 3869 - 387, September / October, 2016. Sahraoui, M.; Cardoso, A. J. M.; Yahia, K.; Ghoggal, A.: ''The Use of the Modified Prony’s Method for Rotor Speed Estimation in Squirrel Cage Induction Motors''; IEEE Transactions on Industry Applications, Vol. 52, No. 3, pp. 2194-2202, May / June, 2016. Sahraoui, M.; Cardoso, A. J. M.; Ghoggal, A.: ''The Use of a Modified Prony’s Method to Track the Broken Rotor Bars Characteristic Frequencies and Amplitudes, in Three-Phase Induction Motors''; IEEE Transactions on Industry Applications, Vol. 51, No. 3, pp. 2136-2147, May / June, 2015. Zouzou, S. E.; Sahraoui, M.; Yahia, K.: ''Induction motors broken rotor bars detection using MCSA and neural network: experimental research''; International Journal of System Assurance Engineering and Management, Vol. 2, No. 4, pp. 173-181, June, 2013. Laadjal, K.; Sahraoui, M.; Cardoso, A. J. M.; Amaral, A. M. R.: ''On-Line Estimation of Aluminum Electrolytic-Capacitor Parameters Using a Modified Prony’s Method''; IEEE International Symposium on Diagnostics for Electrical Machines, Power Electronics & Drives, Tinos, Greece, pp. 387-393, August / September, 2017. Yahia, K.; Sahraoui, M.; Cardoso, A. J. M.; Ghoggal, A.: ''The Use of a Modified Prony's Method to Detect the Airgap-Eccentricity Occurrence in Induction Motors''; IEEE International Symposium on Diagnostics for Electrical Machines, Power Electronics & Drives, Guarda, Portugal, pp. 441-447, September, 2015. Sahraoui, M.; Cardoso, A. J. M.; Yahia, K.; Ghoggal, A.: ''The Use of the Modified Prony's Method for Rotor Speed Estimation in Squirrel Cage Induction Motors''; IEEE International Symposium on Diagnostics for Electrical Machines, Power Electronics & Drives, Guarda, Portugal, pp. 455-460, September, 2015. Sahraoui, M.; Cardoso, A. J. M.; Ghoggal, A.: ''The Use of a Modified Prony's Method to Track the Broken Rotor Bars Characteristic Frequencies and Amplitudes, in Three-Phase Induction Motors''; International Symposium on Power Electronics, Electrical Drives, Automation and Motion, Ischia, Italy, pp. 213-218, June, 2014. Azouze, T. E., ''Detection of Short-Circuit Faults between Stator Turns by Current Analysis'', Supervisor: Sahraoui, M., University of Biskra, Algeria, 2017. Gheithan, B. Z. H., ''Estimation of the Speed of an Asynchronous Motor by the Prony Method using Multi Filter'', Supervisor: Sahraoui, M., University of Biskra, Algeria, 2017. Eddine, B. M. H., ''Eccentricity Fault Detection using Prony’s Method'', Supervisor: Sahraoui, M., University of Biskra, Algeria, 2016. Elhacene, A., ''Estimating the Speed of Asynchronous Machines using Prony’s Method'', Supervisor: Sahraoui, M., University of Biskra, Algeria, 2016. Khabouri, H., ''Speed Estimation of Asynchronous Motors for the Current Spectral Analysis'', Supervisor: Sahraoui, M., University of Biskra, Algeria, 2015. Rochedi, B., ''The Use of the Prony’s Method for the Fault Diagnosis in Asynchronous Motors'', Supervisor: Sahraoui, M., University of Biskra, Algeria, 2015. Laadjal, K., ''Fault Diagnosis Contribution of Electrolytic Capacitors: Application to DC-DC Converters (in French)'', Supervisor: Sahraoui, M., Co-Supervisor: Cardoso, A. J. M., University of Biskra, Algeria, 2018.